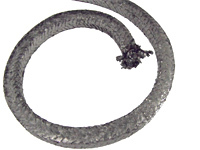 At the Jim Ray Company, we specialize in manufacturing braided expanded graphite products as well as die cutting and forming expanded graphite sheet and ribbon. The seals we produce function as lockscrew packing for wellheads, stem packing for ball and gate valves, and our new LCP high temperature stem seal packing. We service the petrochemical and OEM industries offering prototype to large volume production runs with lead times usually in the two to six week range. 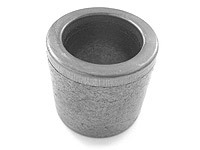 Our seals can incorporate stainless steel caps or mesh and have operating temperatures to 800 deg. F (steam to 1200 deg. F). With the proper geometry, pressures up to 20,000 PSI can be sealed. For more information about our molded graphite seals, see the table below or contact the Jim Ray Company directly. UltraBraid is a braided flexible graphite packing. It is available in a variety of styles to seal rotary and reciprocating pumps, valves, wellheads, and other applications in OEM products and industrial plant maintenance. UltraBraid style 950 LockScrew packing is die formed with dual integral stainless steel caps to provide extrusion resistance and sealing surfaces in one easy to use cartridge. Copyright © 2019 Jim Ray Company. All rights reserved.